Benchmark testing indicates that the Ouya console is already seriously out-muscled by many popular mobile phones and tablets on the market. The Android-powered Ouya console that made a big splash on Kickstarter hasn't been released to the general public, yet it's already buried in the middle of Futuremark's April 2013 benchmark ranking of mobile devices. With a 1.7 GHz quad-core ARM Cortex-A9 CPU and Nvidia GeForce ULP clocked at 520 MHz, the Ouya scored a Futuremark performance rating of 3995, good enough for 78th place on the chart - behind popular mobiles including the HTC One X, the Samsung Galaxy S III and the Sony Xperia V. The top-ranked device, the Xiami MI-2s, managed a Futuremark performance score of 11,324, nearly triple that of the Ouya. It's not necessarily a surprise given how quickly mobile hardware evolves, but does it matter? It doesn't look great on the surface - numbers don't lie, and nobody brags about 78th place - but in the real world, it probably won't be an issue. 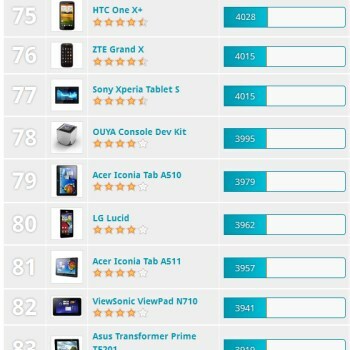 For one thing, as VentureBeat noted, most mobile developers aim their products squarely at the most popular hardware on the market, which at the moment would be the Galaxy S III, which scored just a hair over 5000 on the same test, and the Nexus 7 tablet, which actually came in lower, at 3551 - both well within the Ouya's range. Price is also a factor: The 16GB Wifi-only Nexus 7 is roughly $200 from Google, while the Galaxy S III, unlocked and without carrier subsidy, will set you back $700 at Best Buy. The Ouya is a hundred bucks for a 1080p gaming console that supports streaming video (possibly including Netflix and Hulu at some point in the future), and if your kids get a little rammy and break the thing, it's not the end of the world. The middling score could prove to be a PR knock against the Ouya, if only because mainstream consumers who have no idea what a Futuremark score actually represents may be put off by the less-than-spectacular showing. But while there is perhaps some value in saying that the Ouya is much slower than the Pantech Vega R3, it's just as valid (sort of) to say that it's also much slower than Susan Arendt's dog Alice. Alice, on the other hand, does not have HDMI out; but the Ouya will not throw up on your carpet. Alice will keep you company when the power goes out. Ouya won't eat the furniture if it doesn't get twice-daily walks. Which is better? Tough call - but it's not the sort of argument that can be settled with a single, arbitrary performance score.